Strike Force (4yo g Lookin At Lucky x Tapanappa) returned to his best form yesterday when taking out the Donalda Motors Maffra Cup BM78 Handicap (1617m) at Sale under the guidance of stable rider Patrick Moloney. Stepping back up to the mile, he jumped away from the gates well from a potentially sticky draw, allowing Moloney to find a nice position in the early stages and race handy throughout the trip. When asked for an effort at the 400m, he came at them three-wide to win by a length on the line - bringing his career earnings up to AU $216,100. “Strike Force won very well, he has matured beautifully and is a much more relaxed professional horse of late. 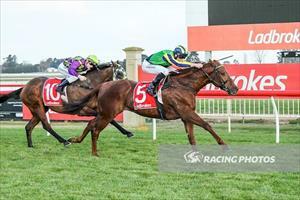 I am absolutely thrilled to see him registering this win for a terrific group of owners. He will now head towards the VRC-CRV Winter Championship Series Final (1600m) run on 8 July” said Mike Moroney. A Paul Moroney Bloodstock selection from the draft of Lomar Park Stud at the 2014 Magic Millions Gold Coast Yearling Sale, Strike Force carries the very well-known colours of long time stable client and supporter Lib Petagna. Congratulations to winning connections L Petagna, R & C Legh Racing, Pulitano Thoroughbreds Pty Ltd, Kariba Racing, GJDM Racing, J Versace, A Melideo, Grandlodge Racing & M Ragusa.